Please feel free to bring your own lunch and we'll supply the water and snacks. 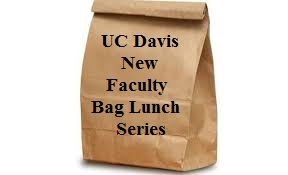 The Vice Provost - Academic Affairs provides a bag lunch lecture series for new faculty (within three years of hire) to orient them to the UC Davis campus life and culture as well as providing assistance in their professional development. Speakers including the Vice Provost and other campus leaders and administrators; department chairs, and resource/service unit directors. "Emerging Topic" sessions serve as a placeholder for hot topics that could evolve into bag lunch sessions. We're in the process of scheduling events for the upcoming academic year. Please check back in September. To assist new academic senate faculty in the development of a successful career at UC Davis, Academic Affairs offers a workshop for incoming faculty every fall quarter. This day-long session provides an overview and orientation in key areas of interest to incoming faculty. Topics may include the academic personnel process, dossier evaluation, shared governance, work-life balance and policies, and Faculty Code of Conduct. Whenever possible, the workshop features advice from recently-tenured faculty. The session represents a great opportunity to network with colleagues and gain valuable information about faculty development at UC Davis. A complimentary continental breakfast and catered lunch are provided. Please note that if you are a School of Medicine new faculty in the Clinical X and Clinical Professor series, our feedback from previous attendees indicates that the information provided at the new faculty workshop on the Davis campus was not as helpful to the new faculty in these series, as was that presented at the School of Medicine new faculty workshop. The next School of Medicine new faculty workshop is scheduled for April 6, 2016 and more information may be found at this link: http://www.ucdmc.ucdavis.edu/facultydev/orientation.html. For further information, please contact Lynn Daum, Executive Analyst to the Vice Provost - Academic Affairs, at (530) 752-2072 or lmdaum@ucdavis.edu.